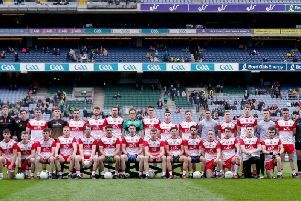 Tyrone’s hopes of surviving in Division One of the National League are hanging by a thread after suffering a crushing defeat at the hands of Donegal at MacCumhaill Park in Ballybofey on Sunday afternoon. This was a must win game for both sides and it was expected to go right to the wire but on the day the visitors had no answer to a Donegal side who were worthy ten point winners. It was a poor display from Tyrone as they managed only six points during the course of the game with only two of those coming from play and with All Ireland champions Kerry the visitors to Healy Park this Sunday they have it all to do if they are to remain in the top flight. There was little between the sides at the end of the opening quarter with Donegal shading things 0-4 to 0-3 but then they just took over as they held their opponents scoreless for the remainder of the half. Leading 1-9 to 0-3 at the break it was already all over against a Tyrone side who were struggling all over the park. Donegal captain Michael Murphy gave his side a lead that they were never to lose after only fourteen seconds before the same player landed a mammoth free from fifty five metres out. Darren McCurry then opened Tyrone’s account from a fifth metre free but it was Donegal who were looking the sharper side with Martin McElhinney on target before full back Neil McGee joined the attack to register. Ronan O’Neill and Connor McAliskey reduced the deficit to the minimum but that was as good as it got for Tyrone. They lost keeper Niall Morgan to injury with Sean Fox coming on for his debut and with Murphy proving unerring from frees Donegal began to pull away. Four minutes before the break Ryan McHugh finished to the net from close range after a Frank McGlynn effort had come back off the post and there was a long way back for Tyrone. Sean Cavanagh, who didn’t start, was sprung from the bench for the second half but Donegal continued to dominate. Murphy split the posts from sixty metres out with McHugh on target as well before Peter Harte responded with two fine points within a minute of each other. In the final 23 minutes all Tyrone could muster was a point from a Cavanagh free in injury time at the end of the game. In between times McGlynn and Patrick McBrearty added to Donegal’s tally as they eased to victory with plenty to spare.